Caption slip reads: "Date: 1961-09-08. Assignment: TWA Public Relations. 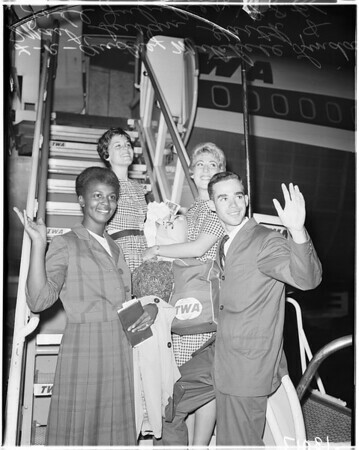 Returning members of the 1961 UCLA Project India team are shown above after arriving by TWA SuperJet at International Airport Friday night. The college students have spent the past three summer months in India teaching and working with the people of India. Purpose of the project is to spread mutual understanding between the two countries. L to R: Audrey Mitchell, Linda Mast, Susan Garth, Joel Jubilier".